Greenland is poised to get its first female prime minister after a centrist party that supports tapping the Arctic island's vast mineral wealth, including uranium, won national elections, a complete vote count showed Wednesday. 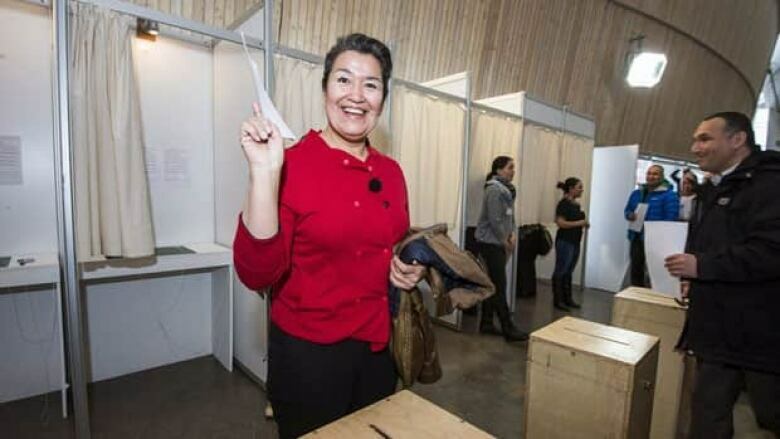 With all votes counted, Aleqa Hammond's centrist Siumut party won 42.8 per cent and 14 seats, while incumbent Premier Kuupik Kleist's left-leaning Inuit Ataqatigiit mustered 34.4 per cent. Hammond has said her party was ready to accept uranium mining if the ore contains a maximum 0.1 per cent uranium oxide. So far, the zero-tolerance policy could affect only exploration in southern Greenland, where an Australian company has estimated it could extract up to 40,000 tons of rare earth metals per year, with some uranium as by-product. An equally contentious issue is immigrant labour, which Greenland, which has a population of 57,000, will need if it is to develop a viable mining industry. Hammond's Siumut party has accused the current government of moving too fast, accusing it of rushing through a law in December that allows large mining projects to import labor from places like China. Voter turnout was 74.2 percent of the 40,500 eligible voters — an approximate three per cent increase from 2009.